VATICAN CITY (CNS) — Gone are the days when regularly discussing one’s favorite works of art in the Vatican Museums and funding the restoration of historic pieces was limited to a very small group of people. 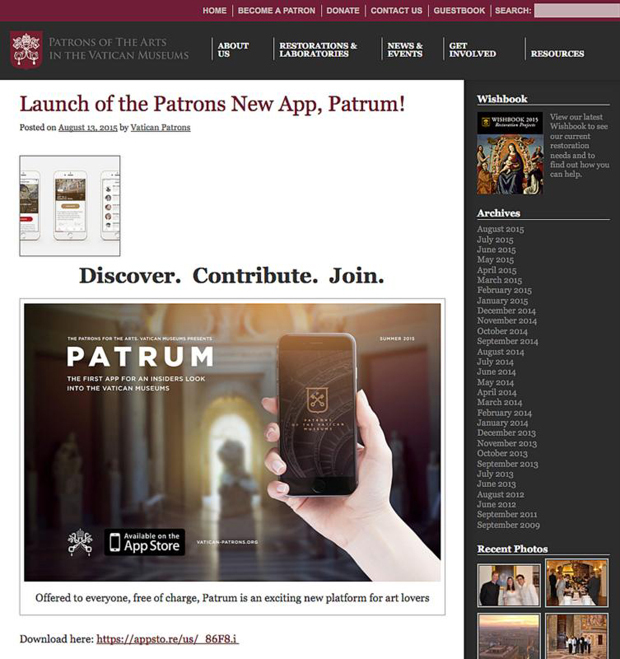 “Patrum,” an app launched in mid-August by the Patrons of the Arts in the Vatican Museums, is “the first ever cultural institution app bringing together instant chat technology, crowd-source fundraising and online community building,” according to its website. Juliana Biondo, the digital initiatives manager for the patrons group, told Catholic News Service that while finding people to help fund projects was important, it was not the main goal. The app is doing just that; analytic software shows that there have been more than 5,300 downloads and the number of users is increasing every day. The growing usership “is the most satisfying thing because I know I spent a lot of time thinking about how to present the information to make it acceptable, approachable, readable and interesting,” Biondo said. The app was designed to expand the “patrons” of the Vatican Museums to more than just the people visiting the museum in person. Through the app users can choose to donate a minimum of $10 to a restoration project. For those hoping to make larger donations, there’s an option to become a patron. Patrons have chapters in different cities around the world and members adopt various projects to restore with their pooled funds. On average, one to two people apply to become a patron each month; since the app launched a total of 13 have inquired, Biondo said. — “Idea,” which gives fun facts about the museums’ collections, the pope, papal gardens and more. — “Person,” which spotlights a museum staff member, curator or patron. — “Event,” where one can find various events patron chapters are hosting worldwide. — “Restoration Projects,” where one can find projects that need restoration funding. There is also a push notification capability that notifies users whenever something they have previously shown interest in is updated. The news pieces can be saved to a “My Interests” page for later referral and can also spur conversation through the apps chat feature.